The example displays a map of the current location or, if no position is available, it uses Brisbane/Australia. 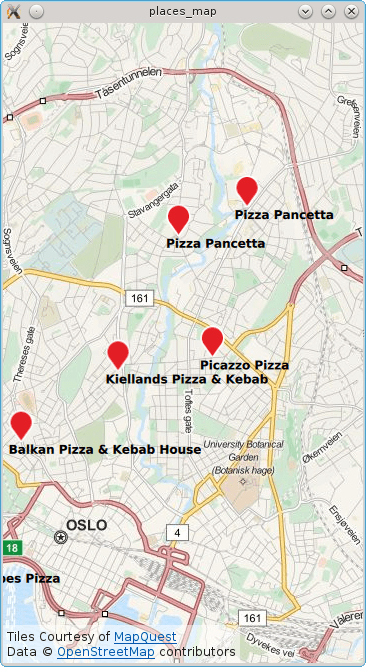 Subsequently a search for places matching the term "pizza" is performed and each result shown on the map. To write the QML application that will show places on a map, we start by making the following import declarations. Instantiate a Plugin instance. The Plugin is effectively the backend from where places are sourced from. Depending on the chosen plugin some manadatory parameters may be needed. In this case the OSM plugin is selected which does not have any mandatory parameters. The map is displayed by using the Map type and inside we declare the MapItemView and supply the search model and a delegate. An inline delegate has been used and we have assumed that every search result is of type PlaceSerachesult. Consequently it is assumed that we always have access to the place role, other search result types may not have a place role. Finally, a PositionSource is used to reset the map to the curent location and find "pizza" places in the new area. The position information is updated every 2 minutes and if the new position is more than 500 meters away from the last pizza search area the place search is retriggered.